School is in session, the leaves are changing colour and Halloween draws near. Fall is a season of transition – for everything from nature, to our diets, to our end-of-year goals. What if one thing remained the same? Scotiabank’s economists are confidently ensuring the public that interest rates are safely steady until 2016. The economists are basing this speculation on two points. The Bank of Canada language seems to indicate the economy’s “spare capacity” will last until sometime in 2016. Should this occur, Scotiabank’s economists still maintain that demand until 2016 will not far exceed the norm, meaning there would be no reason for The Bank of Canada raise rates. The majority of analysts consider The Bank of Canada’s 1% policy rate a safe bet until late 2014 or early 2015. However, they agree that such a stimulative level policy rate will be sustainable for longer than another two or three years. A low interest rate is typically seen as a positive: it boosts economic performance since households and businesses can more readily afford to finance investments and spending. However, The Bank of Canada has been warning Canadians that low interest rates can be misleading, particularly in persuading people to spend beyond their means. If interest rates are projected to remain low and stable for the next one to three years, then you have two take-aways. First, you have the ability to plan ahead. We can meet and plan how to get you and your family into a home before the rates increase. We can also look at your finances and create a plan in case rates do rise. Second, now is the time to take a good, long look at your mortgage contract. I’d gladly sit down with you and go over the fine print with you. In case rates do rise, you can know what to expect and how to counter any problems ahead of time. Be proactive: Get yourself into a home and create a sustainable plan so that when rates rise, you don’t stress! The boys are excited about Halloween, even I can remember feeling the candy craze! We had a lovely summer, the kids are back in school, and now we, like all of you, are in the “fall crunch.” That is the term for the lovely time of year between the two major holidays where you try to conquer your to-do list with fervour. This fall is bringing some good changes. I am excited to see where they will take me! If you feel the change in the season warrants a change of home for you or your family, let’s look at your options. 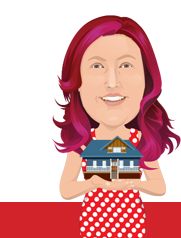 There is a mortgage to suit any need, and I am happy to help you find the right fit for you. Have a Happy Thanksgiving and a Happy Halloween! If you or someone you know are concerned about the future of interest rates or the housing market, I'd be glad to sit down, go over the trends and figures, and create a custom plan for you.